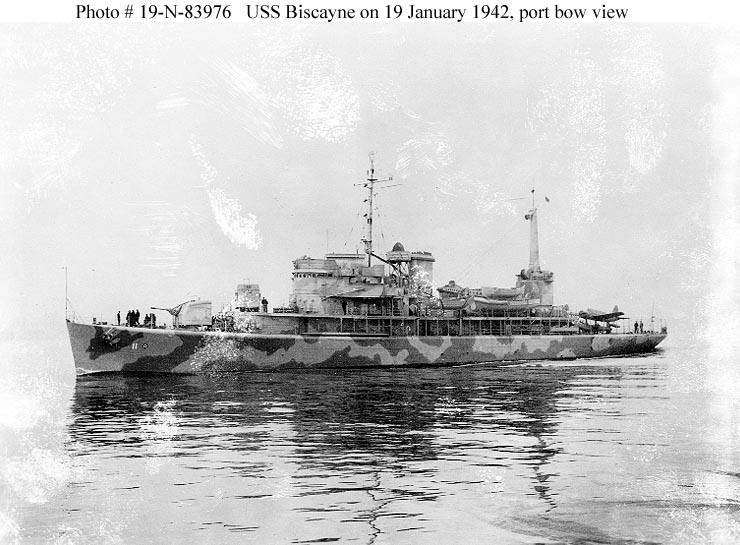 USS Biscayne, the second ship of the Barnegat class of 1,766-ton small seaplane tenders, was built at the Puget Sound Navy Yard, Bremerton, Washington, and was commissioned in July 1941 in a joint ceremony with Barnegat (AVP-10). 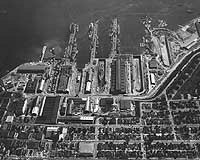 She initially conducted trials of the new AVP design, first in the Puget Sound area and after December 1941 near Boston, Massachusetts. 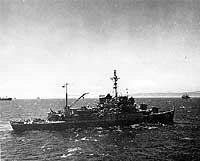 Between May and September 1942 she served as communications ship in Greenland supporting the buildup of U.S. air power in England. In November she supported the movement of a seaplane squadron from Guantanamo Bay, Cuba, to Freetown, Sierra Leone, then moved north with her squadron to particpate in the North African operations. 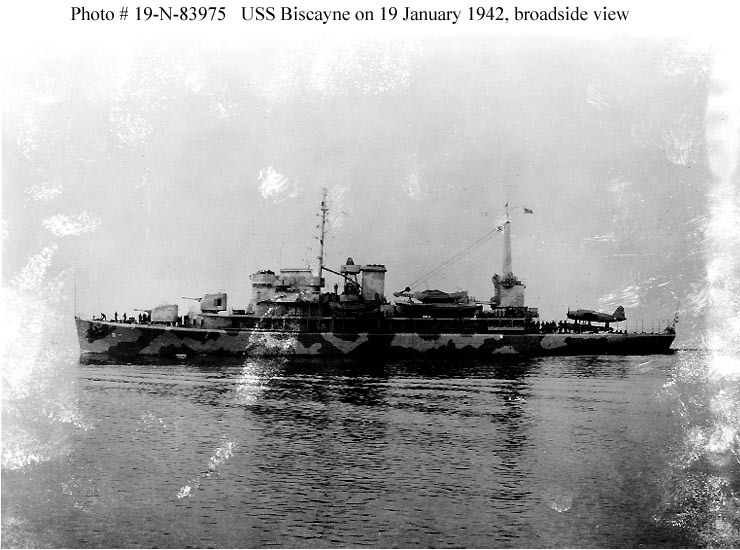 In April 1943 Biscayne was converted to a communications vessel at Oran and became an amphibious force flagship, initially supporting RADM Richard L. Connolly, Commander of Landing Craft and Beaches, Northwest African Waters. 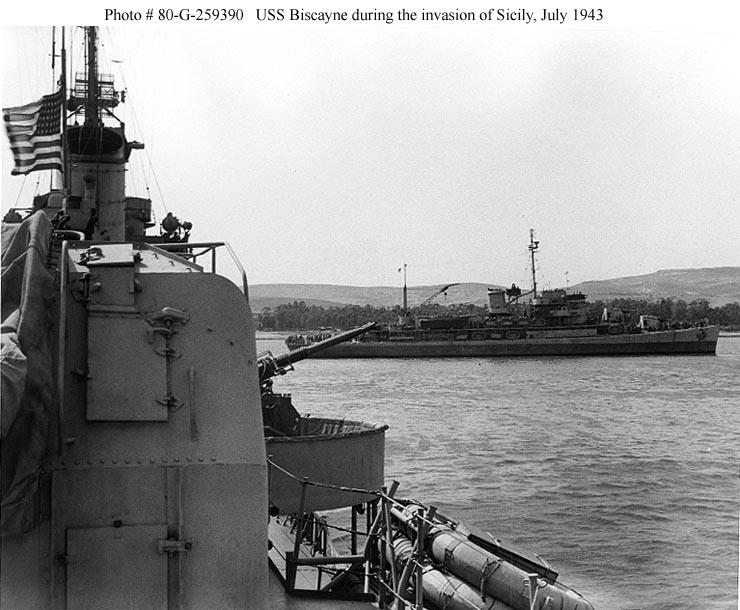 She then helped direct the invasions at Licata, Sicily, in July 1943, Salerno in September 1943, Anzio in January 1944, and southern France in August 1944. 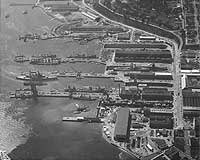 Reflecting this employment, she was reclassified AGC-18 in October 1944. 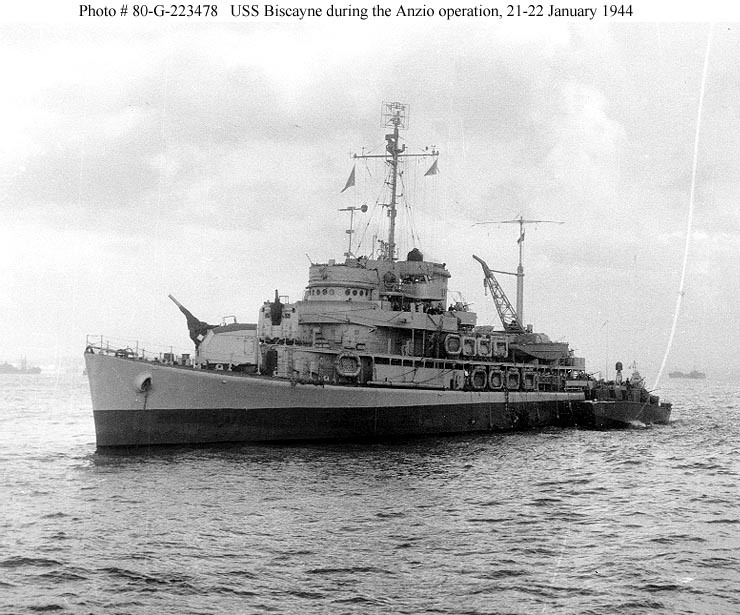 However upon arrival at Pearl Harbor in January 1945 she was found unsuitable for carrying the flag and staff of an amphibious task force commander and was assigned instead as flagship of a destroyer squadron. She subsequently participated in the Iwo Jima, Kerama Retto, and Okinawa. After returning to the U.S., she served in the spring of 1946 as quarters for the aviation instruction crew at the U.S. Naval Academy at Annapolis, Maryland. Decommissioned in June 1946, she was stricken and turned over to the Coast Guard in July 1946. She served as USCG Dexter (WAVP-385, later WHEC-385) until decommissioned and returned to the Navy in 1968 for use as a target. 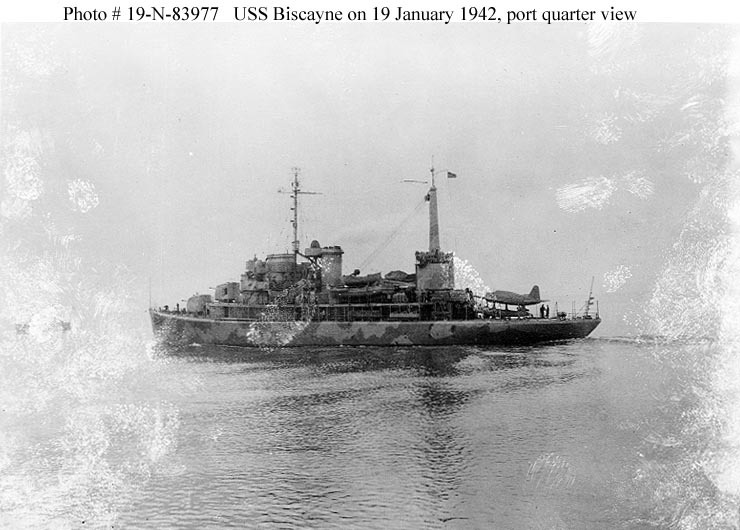 This page features all our views of USS Biscayne (AVP-11). Broadside view showing her at the Boston Navy Yard on 19 January 1942 in her original configuration with a large crane and clear fantail for handling aircraft. She is carrying a Vought OS2U "Kingfisher." Note: As can be seen, this image (and its original negative) has been badly disfigured by fingerprints. Port bow view showing her at the Boston Navy Yard on 19 January 1942 in her original configuration with a large crane and clear fantail for handling aircraft. She is carrying a Vought OS2U "Kingfisher." Port quarter view showing her at the Boston Navy Yard on 19 January 1942 in her original configuration with a large crane and clear fantail for handling aircraft. She is carrying a Vought OS2U "Kingfisher." 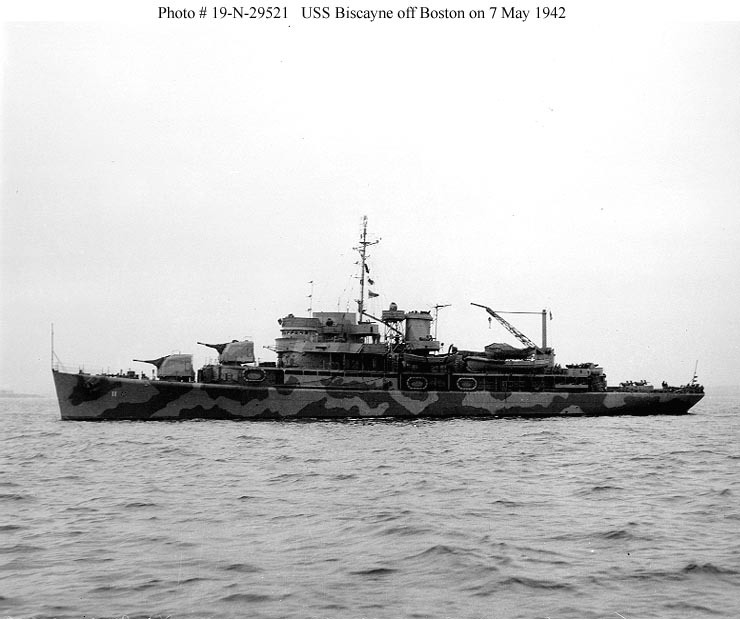 Off the Boston Navy Yard on 7 May 1942. Her large seaplane handling crane has been replaced with a smaller model and she now carries anti-aircraft guns on her fantail. Photographed from USS Buck (DD-420). 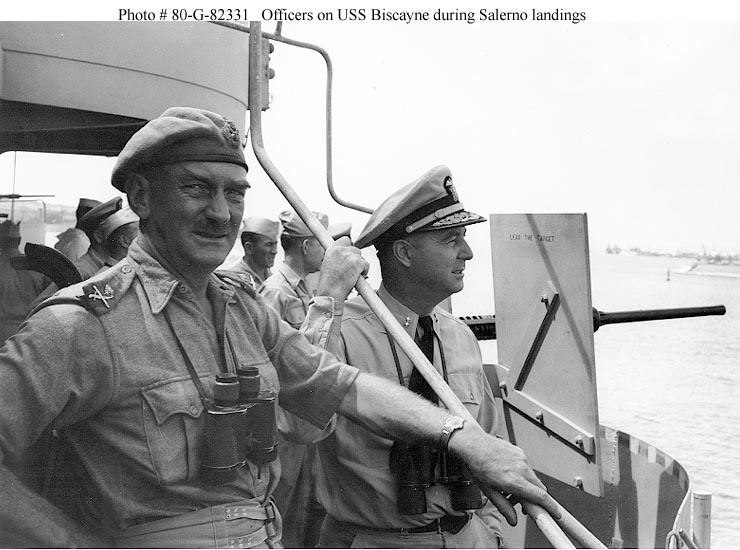 British Gen. J. L. Hawksworth and RADM Richard L. Conolly, USN, aboard USS Biscayne (AVP-11) on 6 September 1943, three days before the Salerno landings. Note the words "LEAD THE TARGET" stencilled on the 20mm gun shield. Serving as invasion force flagship for the Anzio landings, 21-22 January 1944. Photographed from USS Frederick C. Davis (DE-136). Note the PT boat alongside. 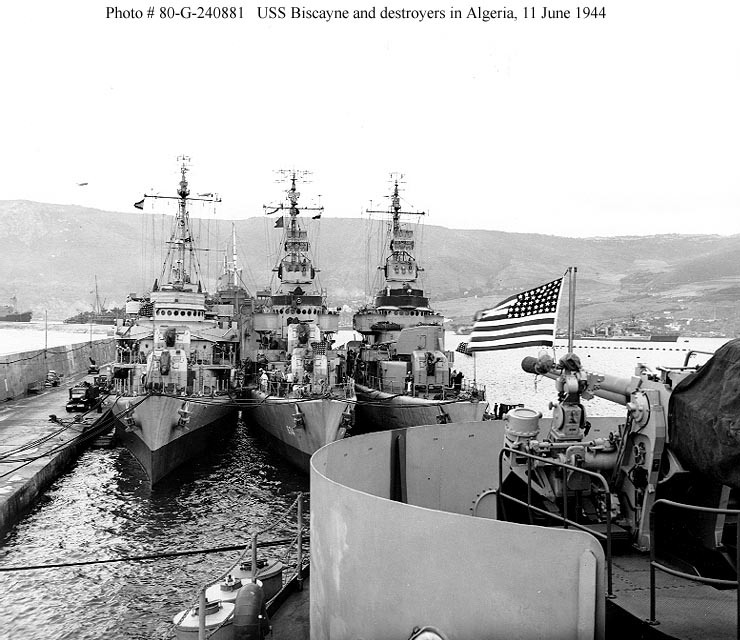 Participating in amphibious exercises off Arzew, Algeria, as flagship of RADM B. J. Rodgers, 10-11 June 1944. Photographed from USS Catoctin (AGC-5). 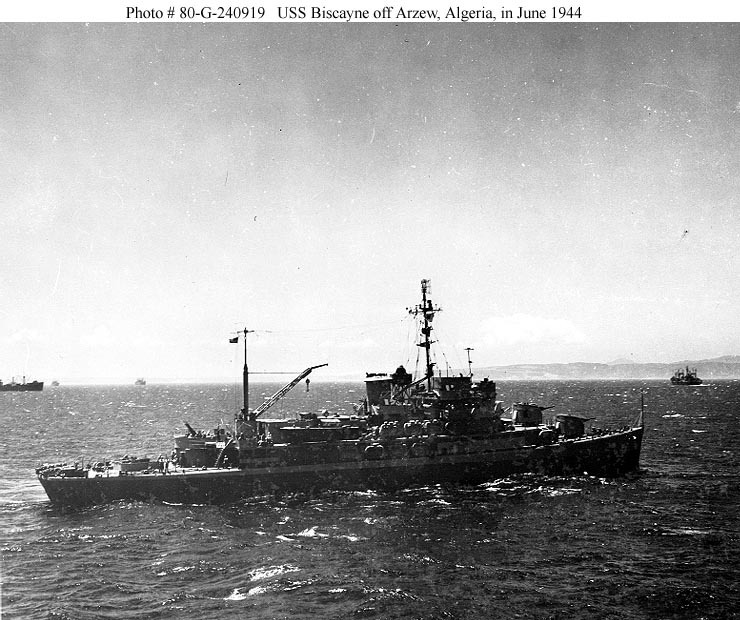 Docked at Arzew, Algeria, on 11 June 1944 during amphibious exercises there. USS Doran (DD-634) and a sister are outboard. Photographed from USS Catoctin (AGC-5). 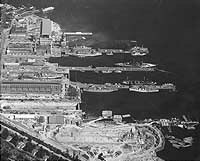 View from the east on 25 July 1941, taken from an aircraft based at Naval Air Station, Seattle, Washington. 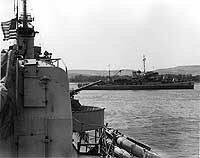 USS Aroostook (AK-44, ex-CM-3) and USS Prometheus (AR-3), alongside the far side of the most distant long pier. Aroostook, at left. is being disassembled. Prometheus is being prepared for recommissioning. 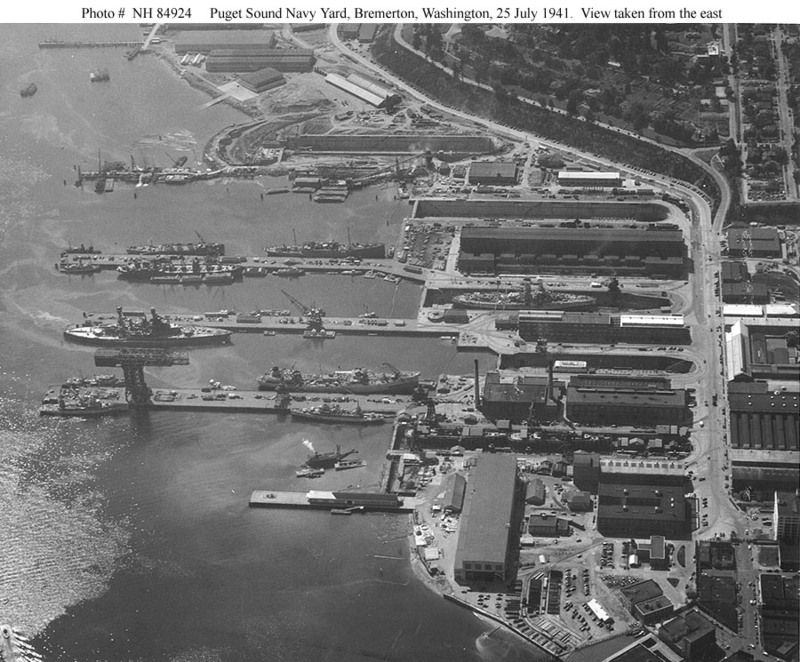 View from the north on 25 July 1941, taken from an aircraft based at Naval Air Station, Seattle, Washington. USS Aroostook (AK-44, ex-CM-3) and USS Prometheus (AR-3), alongside the right side of the long pier in right center. 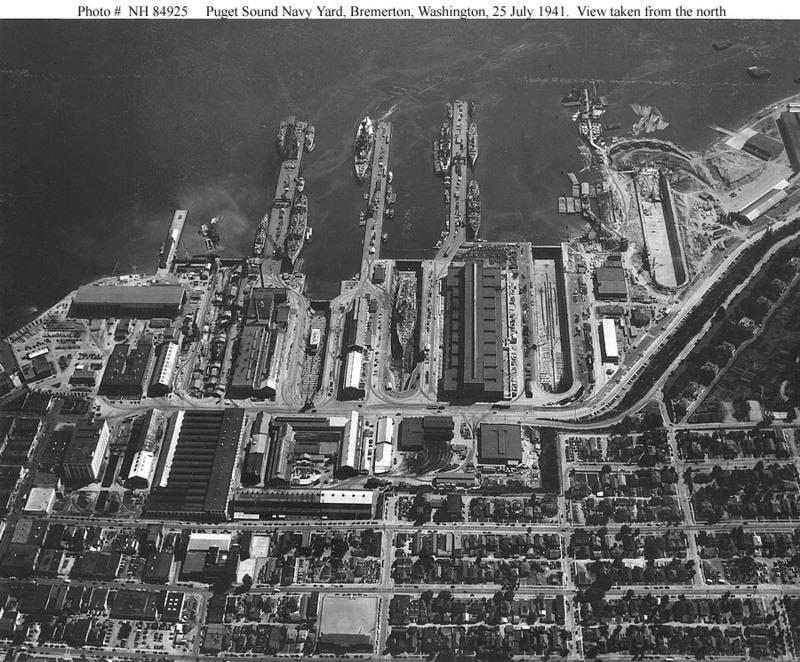 View from the south on 25 July 1941, taken from an aircraft based at Naval Air Station, Seattle, Washington. 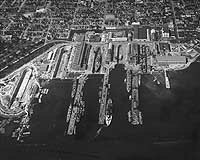 USS Casco (AVP-12) and USS Mackinac (AVP-13), under construction in the drydock at right. 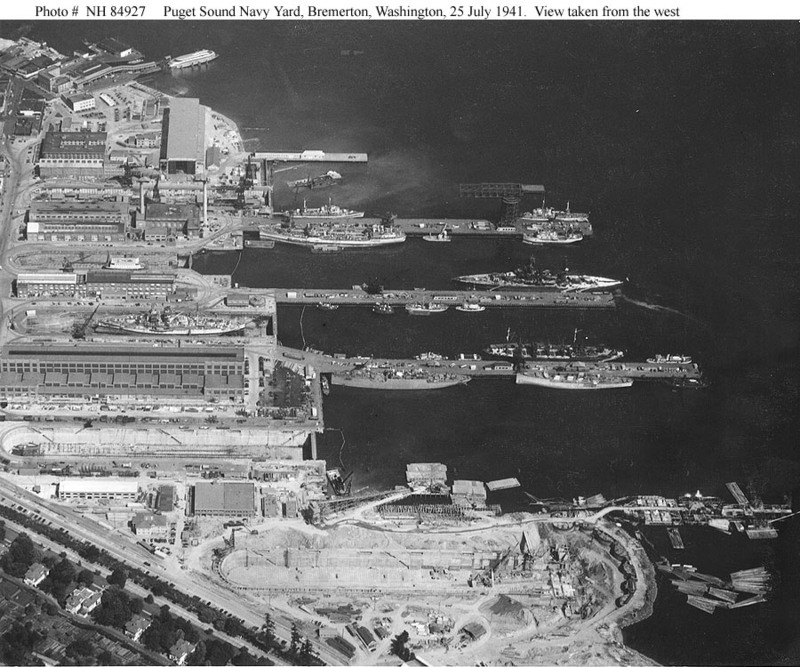 View from the west on 25 July 1941, taken from an aircraft based at Naval Air Station, Seattle, Washington. 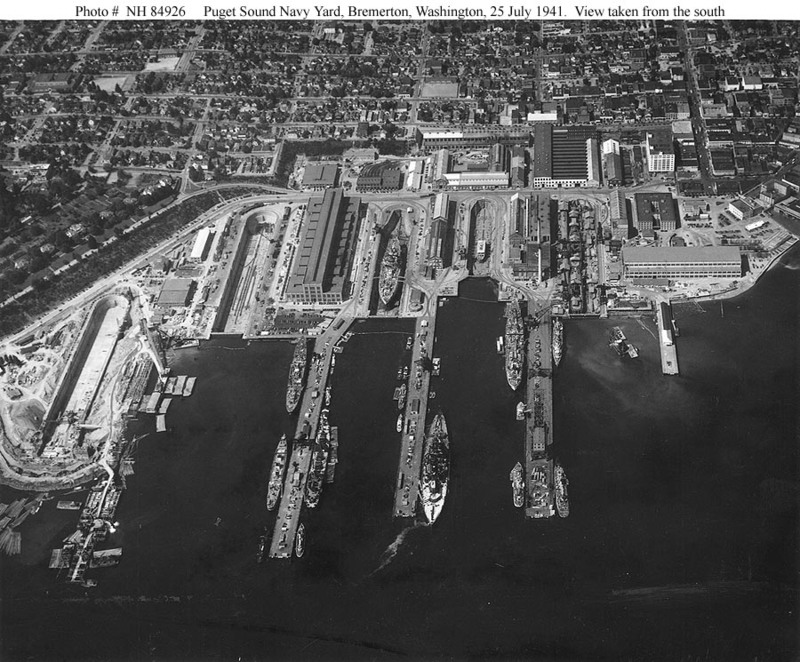 USS Casco (AVP-12) and USS Mackinac (AVP-13), under construction in the drydock in the upper left.